I have well water that has a lot of sulfur, yellow bath water, minerals, suffer smell. My water is acidic as well, I have been told. The water has made my home siding turn yellow. Just rented the home to a family of 6. I need your expert advise on what kind of whole house filter system that will clear this mess up. For your application we recommend a chlorinator, contact tank, neutralizer, MangOX iron filter, and a carbon filter. These systems require little maintenance: there are no filters to change, and you'll only need to add a gallon of chlorine bleach to the solution tank every 1-3 months. We do recommend you perform a water analysis first, to determine what is causing the yellow color and sulfur odors in your water. It sounds like you have hydrogen sulfide, iron, and manganese in your water. The systems listed above will produce clean, iron-free and odor-free water without affecting your water's hardness, though a softener can be added if you so choose. Although there are other ways to eliminate microorganisms and odors in water, chlorination is the most commonly used because it is low cost and effective. For easy and accurate chlorine injection we recommend a Stenner Pump and solution tank system. The Stenner pump uses liquid chlorine bleach, is reliable, easy to install, and very easy to use. It can be adjusted to get just the right amount of chlorine needed for your application. The chlorinator can be adjusted so the chlorine levels are very low in the household (similar to city water) or a low-cost carbon filter can be installed to remove any trace of chlorine tastes and odors. A contact tank provides optimal contact time after chlorine, soda ash, peroxide, or other water-treatment-grade chemicals have been injected into the water. By using a contact tank, you'll reduce the amount of solution need and ensure that the solution being injected is thoroughly mixed and dissolved in the water. 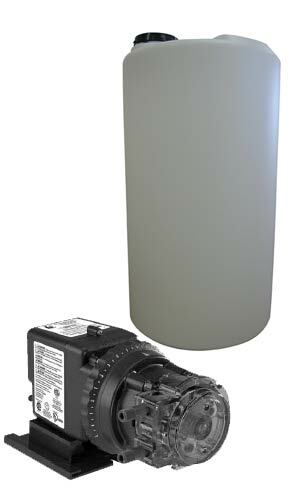 Our WellMate Contact Tanks are made of a seamless inner shell of molded polyethylene for impact and corrosion resistance. The tanks are high quality NSF/ANSI 61 certified tanks for drinking water. Inlet and outlet connections are 1-1/4” but can be reduced to 1” or ¾” if needed. A calcite neutralizer filter will neutralize the low pH (acid water) and help eliminate the corrosive effects of the water. The neutralizer filter comes with everything you need including the calcite and corosex media and simple instructions. Any plumber or person familiar with basic plumbing can install them. Unlike older style neutralizers, our neutralizers use Vortech neutralizer tanks which have an advanced internal screen that eliminates the need for a gravel base, and reduces the amount of water used for backwashing by 30%. A quick once-per-week backwash for 8 to 10 minutes is all it takes to keep the calcite media in good shape. These neutralizers require little maintenance and are very easy to use. Once a year, just add more calcite to the neutralizer tank through the top-fill plug. Most customers use 25 to 50 lbs. a year at a cost of approximately $50 per year. The MangOX Iron Filter removes both dissolved and oxidized iron and manganese by using a special type of solid manganese oxide media which traps the iron and then automatically backwashes out the trapped rust and sediment to drain. The backwash lasts for approximately 15 minutes and takes place automatically, typically every 2 - 3 days, in the middle of the night when no water is being used. If you install a chlorinator as described above, you can backwash the MangOX filter media with a chlorine rinse, which will kill iron bacteria and can extend the life of the MangOX media for many years. For waters containing “rotten egg odors” (hydrogen sulfide), a chlorine feed ahead of the MangOX filter can be used to kill the odor and keep the MangOX media working great. And unlike other media which may last only 3-5 years, MangOX media will last you for more than 10 years! Our Carbon Backwash Filter Systems remove chlorine, tastes, and odors at exceptionally high flow rates with little or no pressure drop. Unlike expensive carbon filter cartridges, the Carbon Backwash Filter Systems use a bed of high grade activated to carbon to filter out chlorine, chemicals and sediment. 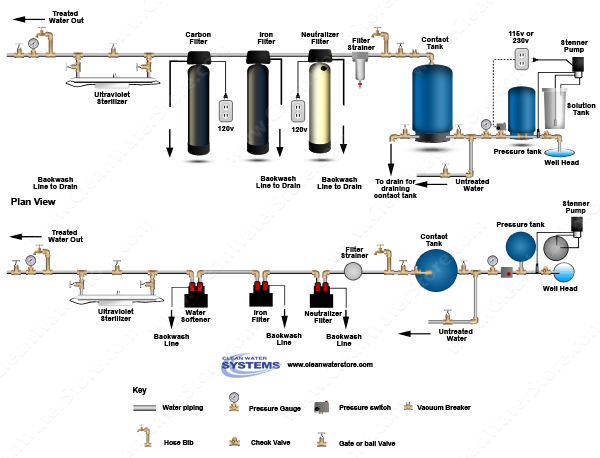 These systems automatically backwash and rinse clean the carbon media inside; there is no need to change short-lived filter cartridges, and no problems with pressure drop from clogged filters. The carbon media typically lasts for 3 - 5 years and is easy to dump out and change. We're confident these systems will help you solve your water problems, Rick, and we hope you'll keep us updated on your system and water quality. If you have any further questions you can e-mail us at support@cleanwaterstore.com, leave a comment on our Facebook, or use our online contact form. Thanks for the letter!